Figure 2: This Italian stamp is from a series commemorating famous Italians. 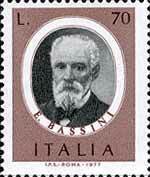 It depicts Eduordo Bassini. Bassini went on and followed up his patients and reported on their progress. The Bassini repair was later morphed into a tight repair where the muscles and conjoined tendon were sutured onto the inguinal ligament. Following Bassini, there were numerous innovations such as the Halstead radical cure (1889). H. O. Marcey a Boston surgeon popularised inguinal hernia repair and there has been disagreement about whether he copied from Bassini or Bassini copied from him. The present consensus is that Bassini was first. The Cooper ligament repair was quite popular for a time in the United States. Earl Shouldice in Ontorio, Canada popularised the Shouldice repair in the 1950's. Glassow reported excellent results from the Shouldice repair in 1973, in his review of 18,400 patients the recurrence rate was 1%. The main problem with the Shouldice repair is that it is not easily learnt by surgeons. And even very experienced surgeons did not get the same results reported by the Shouldice clinic. The tension free repair with mesh was popularised by Lictenstein in 1970. This repair is easily learnt and performed with reproducible results by many different surgeons. By 2002, there were sufficient trial on open mesh vs no-mesh repairs to show the beneficial effects of the mesh repair. [VvdTL+02,GE02] Meshed repairs were shown to dramatically reduce the rate of recurrence, from 7% down to 1% [GE02]. The meta-analysis of 5016 patients in 20 trials showed lower recurrence, quicker return to activities, reduced hospital stay and less persistent pain in the patients treated with a mesh. Subsequent trials have shown that recurrence rate is the same with open and laparoscopic mesh placement. However, laparoscopic repair is associated with less chronic persistent pain than open repair. The latest trend in inguinal hernia surgery is to evaluate lightweight meshes and different approaches to mesh fixation to minimize the problem of chronic persistent pain.